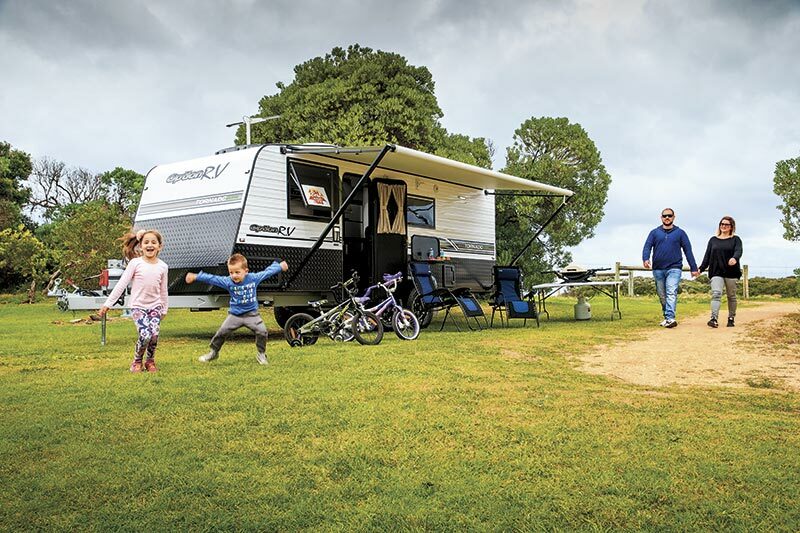 A fair percentage of the caravans available in Australia are designed for two people, as were most of the caravans at Best Aussie Vans this year. But one exception that particularly drew my interest was the Option RV Tornado Equippe, which has a family layout. Not that I am in the market for a family van, but I like to look over the family layouts to see what the manufacturers have come up with, given the various weight and length restraints. Starting in the rear, the triple bunks measure 1.83x0.71m (6ft x 2ft 4in) and are, therefore, adequate for most teenagers. Each bed has its own window, reading light and magazine pouch – so all the essentials are there. Perhaps young children are more flexible than me, but the vertical ladder did not look easy to use. 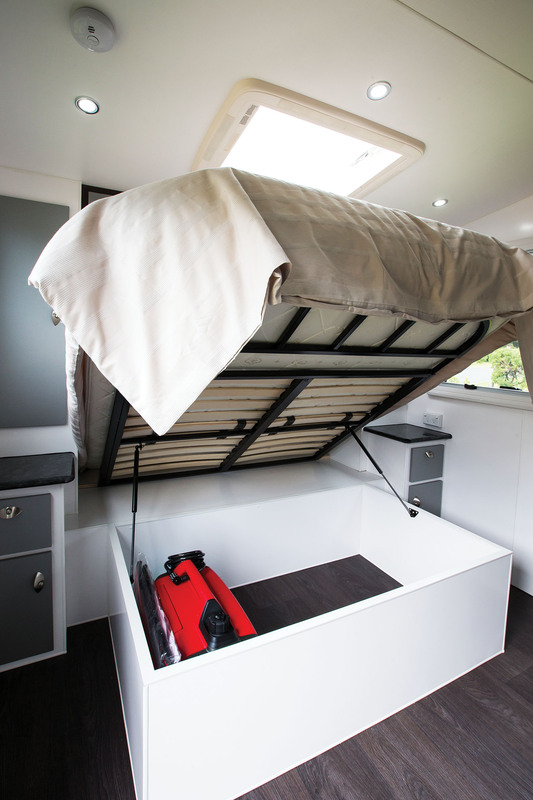 It seems to me that all RV manufacturers, be they of caravans or motorhomes, place form over function when it comes to bed ladders, or relying on the child’s inherent ability to clamber up most things. 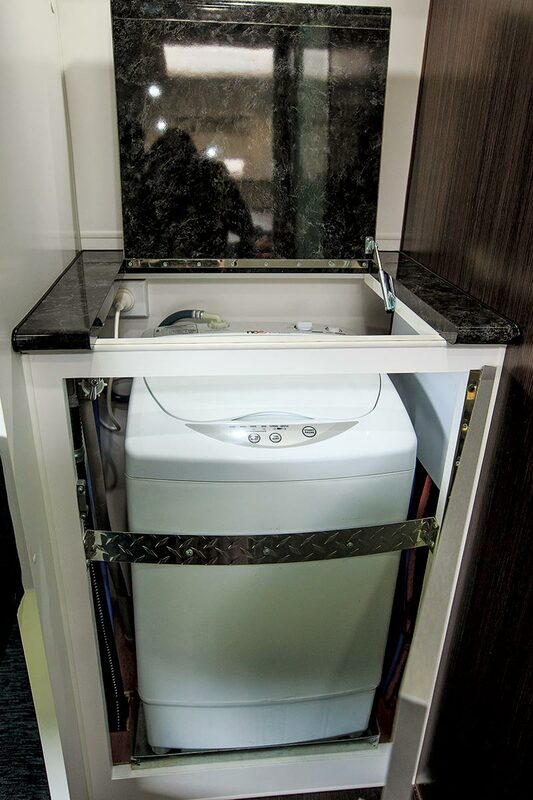 The space between the beds and the bathroom is sometimes used for a wardrobe but, in this case, there’s a top-loading washing machine and an overhead locker. Would mum and dad use the washing machine every day or, given the likely heavy load with three kids on board, visit the local launderette? I thought, perhaps, a wardrobe would have been a better option. On the other hand, a washing machine would prove very useful in a family van in the back of beyond. Whichever you prefer, Option RV can accommodate you. 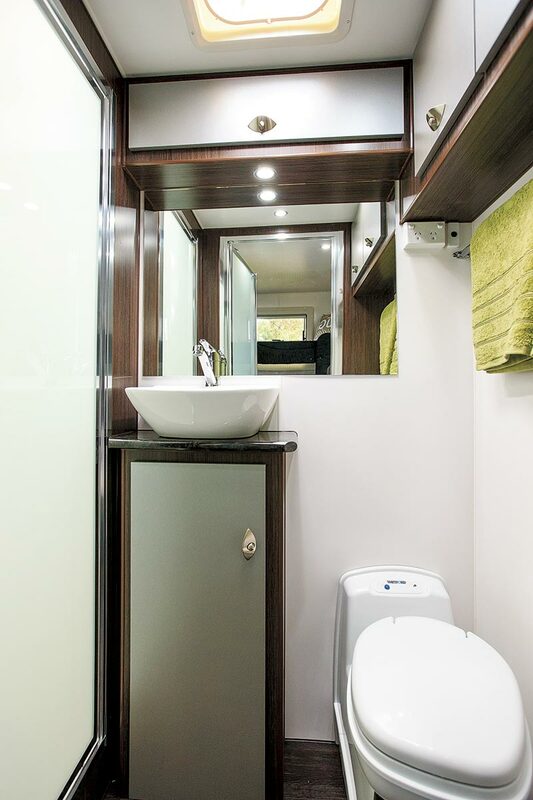 The bathroom is well kitted-out, given the available space, with a separate shower cubicle, cassette toilet, washbasin, wall mirror and a couple of overhead lockers. There’s certainly room to turn around in the bathroom but there might be a bit of a queue in the morning! For the most part, the kitchen is well specced for catering. The 190L three-way fridge, which adjoins the bathroom, will keep the family well fed. Along the bench are a four-burner cooktop/grill/oven and a stainless steel sink, while above the sink and set lower than the overhead lockers is the microwave. Next to that is the multimedia unit (very swish) and, in the locker above, the solar panel regulator, hot water switch and water tank gauges. Where this kitchen is a bit light on is in free benchtop space and storage space. But the cooktop does have a flush lid and there’s always the dinette table for food preparation. For stashing away the supermarket shopping, there are two cupboards, three overhead lockers and one drawer but not much else unless the overhead lockers above the dinette are utilised. In short, if you really want a fully-equipped bathroom, then there’s a trade-off in the kitchen. Similarly, the L-shaped dinette, while reasonably comfortable for two adults, will require at least a couple of folding chairs at meal time if you’ve got a full house. There is a hinged flap at the rear end of the dinette which looks tempting as a seat but is strictly a footrest for a tired parent. A lament I frequently hear from parents looking for a family caravan is that there are not many available. While that is true to a point, it’s a supply and demand situation. There are family layouts available, you just have to keep looking! 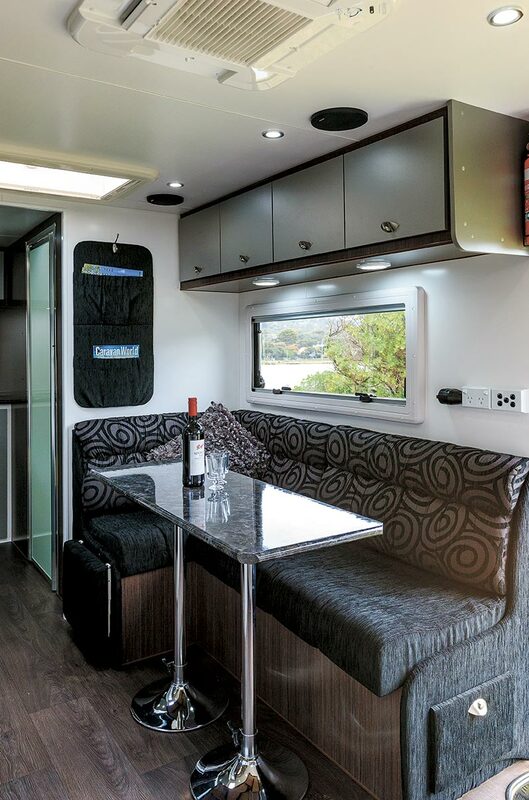 This Option RV Tornado Equippe is a good example of an Australian family van, with sleeping quarters for at least five people (and the dinette can be used as well). Because it’s designed for contemporary needs, hence the full bathroom, some areas, such the kitchen and dinette have been compressed a bit, but all the essentials are there and for the most part, the compromises are well considered. Havind said that, some thought needs to be given to practicalities such as storage (considering the extra gear needed when travelling with kids) before heading off into the wide blue yonder. And that, I should point out, is the major asset of this van: it’s built and designed for that very purpose. The full test appears in Caravan World #533, January 2015. Subscribe today for the latest caravan reviews and news every month!